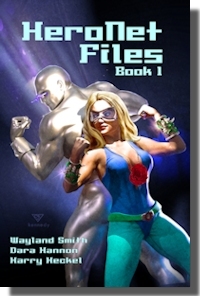 Great news – the long-awaited anthology, HeroNet Files: Book 1, has finally been published. We’ve been teasing it with the fantastic cover art by Sam Kennedy for awhile now, so we’re very excited to be able to announce that it is available in print and in all major ebook formats. Currently you can find it on Amazon (print and Kindle) and on Smashwords, but it will soon be available in all major ebook stores. This book is written for age 14 and up and may be considered inappropriate for children due to strong language, violence, and adult themes. An anthology of novellas by Wayland Smith, Dara Hannon, and Harry Heckel. HeroNet Files: Book 1 contains three novellas about new superheroes and how they learn to come to grips with their powers and responsibilities. And each other. In the first novella, “Argent and The Cobalt Rose” by Wayland Smith, Laura tries to start her career as the Cobalt Rose and winds up with the mysterious loner, Argent, as a mentor. Argent discovers that he has at least as much to learn about life from her as she has to learn about heroing from him. In “Murphy’s Hero” by Dara Hannon, Tiger Iron of the world-famous superteam, the Wardens, must investigate a questionable new hero, Murphy, who may be stealing money from the drug dealers she stops. Finally, in “Hidden Strengths” by Harry Heckel, when Scott develops his own powers, he joins an underground superhuman fighting league and finds himself losing control of his life. Meanwhile, the gladiatrix Diamond decides that he is her hope to escape the brutal world of powered combat. By Blue Oranda Publishing in Uncategorized on April 22, 2014 .